ApsaraVideo VOD is an all-in-one VOD service that supports video collection, editing, uploading, media management, automatic transcoding, video review and analysis, and video distribution acceleration. ApsaraVideo VOD is designed based on Alibaba Cloud infrastructure services. Based on Alibaba Cloud OSS, CDN, and high-quality video transcoding technology, this service can help enterprises and developers to quickly build secure, elastic, and highly customizable VOD platforms and applications. 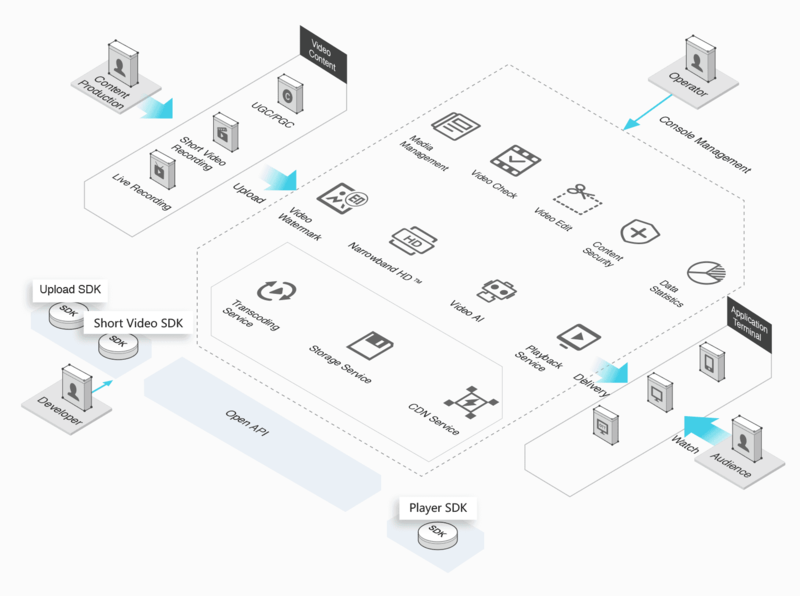 The Web-based console and software development kit (ApsaraVideo VOD API and SDKs) enable you to use and manage VOD services, and integrate your applications and services. Multiple types of ApsaraVideo VOD SDKs are provided, including the upload SDK, player SDK, and short video SDK. All VOD functions are auto scalable, easy to use, and cost-efficient. ApsaraVideo VOD is an end-to-end video service that provides content production, storage, video distribution and playback. Provides multiple easy to use functions, including content auditing, high-performance transcoding, media management, and content production. Supports multiple video protection functions, including anti-leeching, playback authentication, and video encryption. ApsaraVideo VOD is based on more than 1,500 Alibaba Cloud CDN nodes and provides a bandwidth of 90 Tbps to deliver high-quality video playback services. You can upload files from multiple platforms. ApsaraVideo VOD supports multiple file uploads and resumable uploads. ApsaraVideo VOD allows you to upload files from different platforms, including the ApsaraVideo VOD console, API, SDK, and PC client. You have an unlimited number of uploads. The maximum upload size of any file is 50 TB. Multiple file uploads and resumable uploads increase the efficiency of uploads. The short video SDK is a high-performance and easy to use tool that helps developers quickly record and edit videos in their own applications. 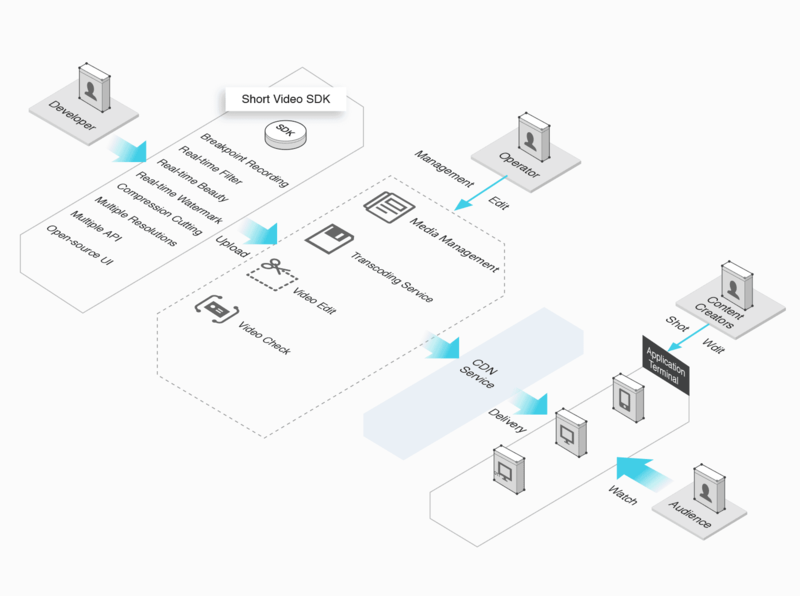 You can integrate the ApsaraVideo SDKs with your own services to save development costs. 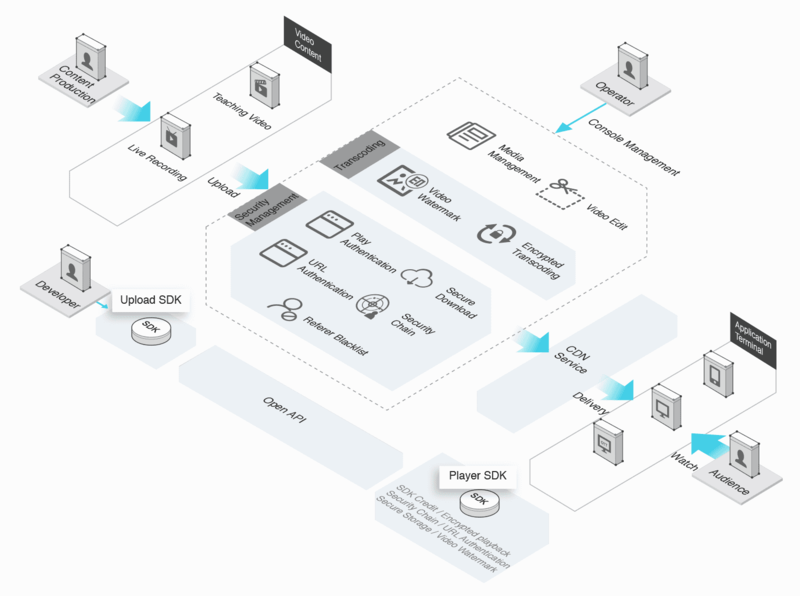 It only takes a minimum of two hours to integrate an SDK. The ApsaraVideo VOD API is easy to use. You can customize your service based on your own business needs. The video recording function is designed with resumable recording, real-time filters, real-time audio mixing, playback speed control, facial recognition, and stickers. You can upload, compress, and crop videos, and add animations, subtitles, and music to videos. ApsaraVideo VOD has been rigorously tested by more than 1,000 application service providers. It is both stable and reliable. You can use the API or media library in the console to manage video information, including media resource categorization and search. You can manage basic information about videos, including titles, descriptions, covers, categories, and tags. You can use multiple keywords to search for specified audio and video resources. Provides a large number of Open API operations for you to obtain, modify, and delete video information. The online video editing and production tool has integrated media resource management and visualized editing functions to improve the efficiency of video editing. You can upload and manage multiple types of media resources, including video, audio, and image resources. You can create a story board to quickly crop and splice videos with special effects, such as subtitles and masks. Supports mainstream video formats, narrowband HD, and video enhancement, for efficient, professional, and customizable video transcoding services. Supports mainstream video formats and provides H.264 and H.265 coding. Provides standard video transcoding templates to support definitions ranging from LD to UHD. ApsaraVideo VOD also supports the 2K, 4K, and custom transcoding formats. Uses the industry-leading TM narrowband HD transcoding technology to reduce 30% of the bandwidth costs without losing video quality. Applies high FPS video enhancement and source file repair technology to improve the definition and smoothness of VODs. Allows you to upload and add PNG images as watermarks and supports visualized watermark position adjustment. Uses private protocols and HLS standard encryption to encrypt videos before transcoding. You must decrypt these videos before playback. Supports secondary authentication to verify all playback requests based on Alibaba Cloud access key authentication. Provides the Referer whitelist and blacklist to block malicious requests. You can customize callbacks to quickly obtain the status of your business as needed. This allows you to respond to and handle business workflows promptly. Supports fine-grained query and export of the last 90 days of business data so that you can learn about resource consumption and assess published videos. Provides stable, smooth, and customizable end-to-end VOD services. ApsaraVideo VOD can be applied to both new video service enterprises and enterprises that have a large number of video resources. This service is customizable and can help these enterprises to quickly build secure and reliable VOD applications for high-quality video playback. ApsaraVideo VOD is an end-to-end service that provides content production, cloud storage, and video distribution and playback. You can use ApsaraVideo VOD to build video services including video transcoding, content review, media management, and content production. ApsaraVideo VOD allows millions of users to stream videos at the same time. The short video service is a complete short video solution that integrates audio and video recording, effect editing, local transcoding, high-speed uploading, auto transcoding, media resource management, video distribution acceleration, and video playback. This service has helped more than 1,000 apps to build the short video function on mobile phones. You can schedule the start time for video cropping and splicing, specify a length to crop video clips, and crop or splice multiple media clips at the same time. Supports screenshot processing and transcoding videos to multiple formats and definitions. Videos can be immediately played after they are published. The ApsaraVideo Player SDK is compatible with all platforms. You can call the player operations to customize your video services. Provides advanced video encryption security schemes to protect your video resources. ApsaraVideo VOD provides an all-in-one solution, allowing users to quickly play videos online. Based on a complete cloud-to-client video encryption scheme, ApsaraVideo VOD can ensure the security of video playback and distribution. Supports encrypted transcoding, secure playback, and secure downloading, and provides multiple authentication and anti-leeching features. Allows you to customize watermarks and create security policies in the cloud for efficient management.